The 'Fisher' building at Ebrington. 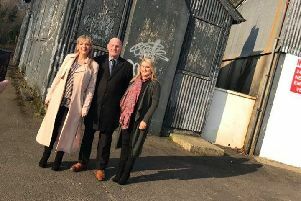 The old canteen at Ebrington is to be developed into a bar and restaurant under new plans that have been lodged with Derry City & Strabane District Council by Toomebridge builder, Phillip McElhone Construction. According to planning documents submitted with a fresh development application, Building 40 or 'Fisher', which is situated on the extreme northwestern corner of the Ebrington parade ground site overlooking the River Foyle, will be turned into a new eatery. A design and access statement completed by Shane Birney Architects on behalf of the applicant states that the development of the bar and restaurant will bring new purpose and life to the former military building and will be in keeping with its historic use as a canteen. The application will ultimately be decided upon by Derry City and Strabane District Council's Planning Committee when it returns following the summer recess.